Learning how to play the keyboard can be a little overwhelming, but having the right instrument can make all the difference. To help you find the best piano keyboards for beginners, we tested a range of products and were surprised by what we found! We put together this list of piano keyboard reviews to help you find the right one. Before we go to that, though, here are the important features you need to keep in mind. Keys: A regular piano has 88 keys so the closer your keyboard has to that, the more realistic it will be. That said, the more keys it has, the bigger it is. Go for something smaller if you’re concerned about portability. Record & Playback: This is a fun feature to have in general so you can write and create songs you can share with other people. It’s also a great learning tool so you can hear yourself and make the needed improvements. Accessories: Some of these keyboards come with minimal accessories while others are loaded with special features. You’ll find everything from stools to music stands, instructional DVDs to free teaching app downloads. We counted the AC adapter as an accessory. Power Source: All of these piano keyboards have the same power sources. They use an AC adaptor and can run on batteries. We feel you need both. AC power that lasts and battery power to take the show on the road. 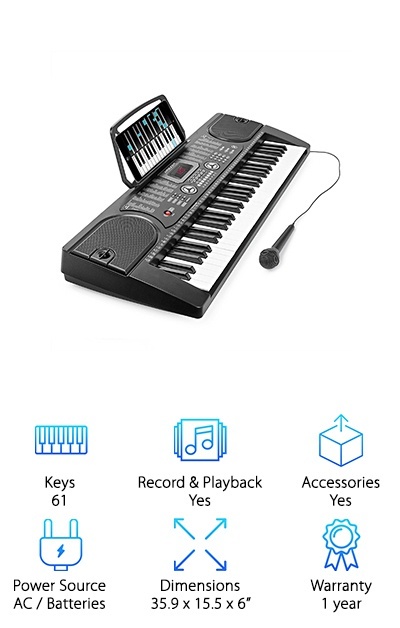 Dimensions: The size of your piano keyboard matters the most when you’re thinking about portability. The smaller and more compact it is, the easier it will be to transport. Remember, the size also correlates to how many keys the keyboard has. Warranty - Warranties are always important, especially when it comes to something that has a lot of parts like electronics. Make sure you read the one that comes with your keyboard so you know what is and isn’t covered and for how long. Now that you know more about how to choose the best piano keyboard for beginners, let’s get to our reviews. Here’s how it works. We put our top pick and budget pick first. That way, if you’re in a hurry, you can take a look at those first. Then, you’ll find the rest of the products that round out our list. There are a wide variety of keyboards on this list so you’re sure to find what you need. Now, let’s do it! This is a keyboard designed to feel like a piano. Graded keys give a real piano feel with lower keys heavier in touch than higher ones. Why is this good for a beginner? It makes the transition from keyboard to piano much easier. You get a ridiculous amount of sound options, too. Get this: nearly 500 different voices, 160 preset styles, and 30 preset songs. Plus, record and playback so you can check your progress or let your songwriting juices flow. That’s not all. You also get Yamaha Education Suite, learning tools that are built-into the instrument to help you improve your skills. We’re not done yet. There is also USB connectivity so you can connect it to your computer and use it with any compatible music software. One of the best things about this best cheap keyboard piano from RockJam keyboard is its size. It’s compact with only 54 keys but still great for a beginner because they keys are full sized. There is a pretty good selection of different sounds, too, including 100 different keyboard sound effects, 100 rhythms, and 8 demo songs. You also get access to multiple training resources including the interactive LCD screen that shows beginners what chords and notes to play. It also comes with a free download for the Piano Maestro app as an additional educational tool. The built-in stereo speakers help your playing sound even better. One more thing: There is a music rest where you can put sheet music or even your iPad while you’re playing. Are you looking for the best cheap piano keyboard? Then take a closer look at the Plixio Electric Music Keyboard. With 54 full sized keys, it’s the perfect size to be taken on the road or for someone who’s a beginner. The interactive LED screen shows the right notes and chords to play. But that’s not all, There are other teaching modes, too. And get this: you get a free download of the #1 educational app for beginners, Piano Maestro for iPad. You can play with 100 different keyboard sound effects and jam along with 100 different rhythms. Or play around with one of the 8 percussion effects. One more thing. It comes with a music rest where you can place sheet music or your iPad while you’re playing. The Hamzer Electronic Piano is packed with some pretty cool features. For starters, you get a lot of different styles. 128 timbres, 120 rhythms, and 61 keyboard percussions. You have a good amount of control with this keyboard, too, thanks to the tempo adjustment feature. It comes with a microphone, too, so you or a friend can sing along as you play. There is also an LCD screen and detachable music stand. There are some cool things that you can do on this one once you have a little experience: auto-bass chords, programming rhythms, plus add in effects like vibrato, sustain, and ensemble. Why does that matter? 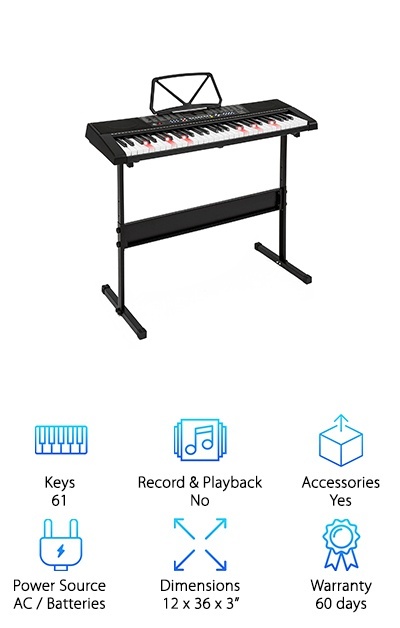 Because it means that this is a great keyboard for a beginner that can also grow with them as they get more experience. 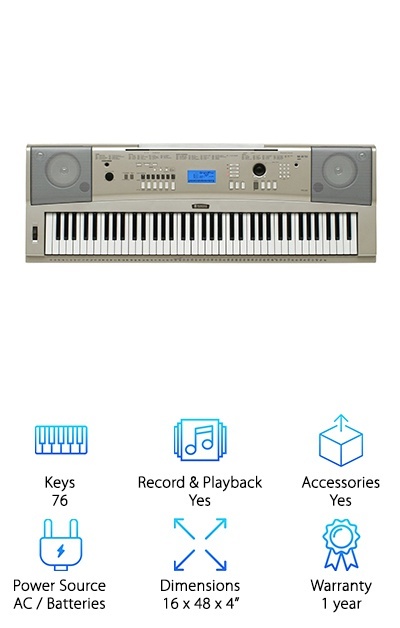 One thing that makes this best keyboard piano for beginners extra special is that the specially designed keys light up. That’s right. When you’re learning to play, it can be hard to learn the keys, notes, and rhythms. This keyboard solves that by making the correct key light up so you know just which one to hit. You’ll learn how to imitate rhythms and melodies which will help you get a feel for the keys more quickly. There are a lot of sound options on this keyboard, too. Exactly how many? 255 timbres, 255 rhythms, and 50 demo songs. It has different patterns and functions, too, like a metronome, rhythm programming, record and playback, and sync. One more thing: it has several jacks available to connect other equipment. 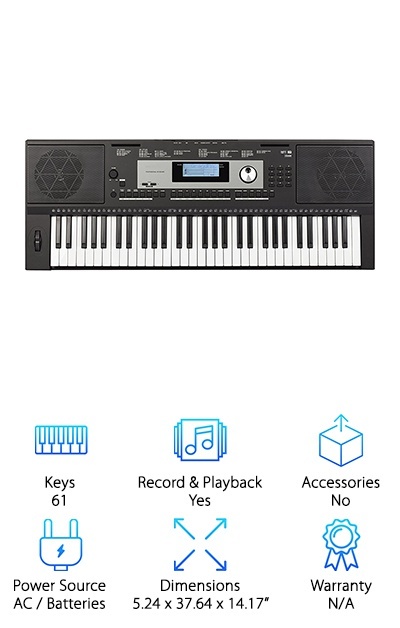 One of the reasons that this is our pick for best portable piano keyboard is because it has so many ways to explore sound. How did they do it? With an astounding 633 different voices. That’s not all. 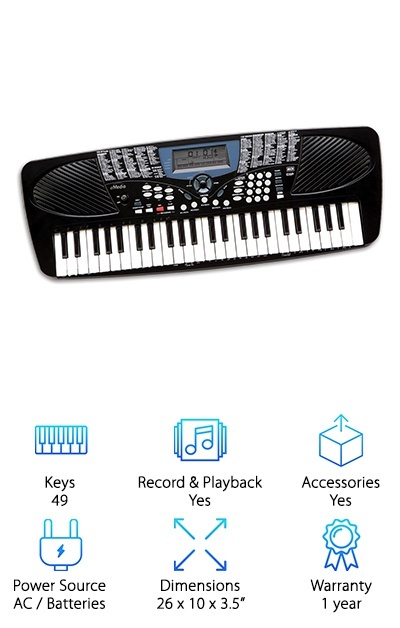 There are also 220 styles and 160 classic songs programmed into this keyboard. The Music Tutorial System uses the classic songs to help teach rhythm and other basics to beginners. There is an easy to use backlit LCD screen to help navigate through all the awesome features that come included. And here’s the kicker: it has a split keyboard function. This allows you to play in two distinctly different voices so you can truly make each song your own. Feel like sharing? You can play in one voice while a friend plays in another. 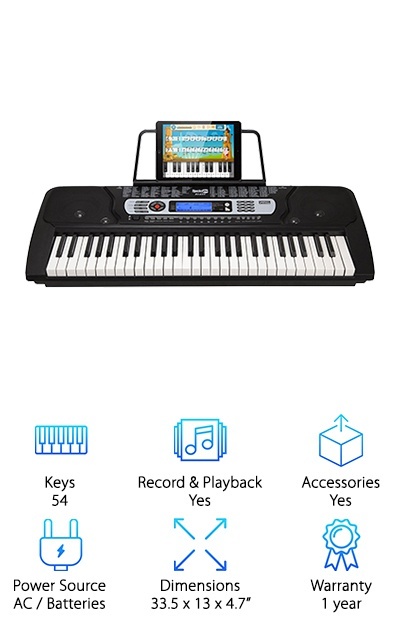 If you want a keyboard that’s made for kids, the eMedia Piano Starter Pack has all the kid-friendly features you need. 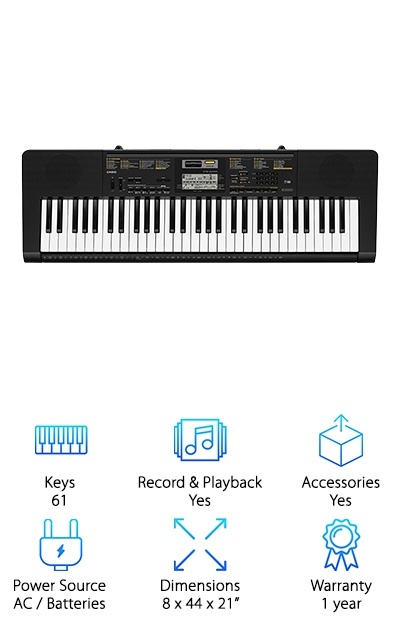 The keyboard is made for small hands plus has built-in speakers and realistic sampled sounds. What is so cool about this keyboard is that it connects to your computer. It comes with an interactive CD and DVD that your child can watch on the computer while learning right along with fun games and activities. They’ll learn proper hand and finger position, rhythm, notes, harmonies, and even how to read sheet music. You can adjust the speed of the songs so kids can learn at their own pace. The program even provides feedback and includes a metronome and digital recorder to keep their learning on track. The Casio Keyboard includes a pretty impressive educational package. You get a lot of accessories with this one: headphones, keyboard stand, 6’ USB cable, and interactive software. 48 of the 61 keys provide polyphony sound so you’ll sound like an orchestra as you try to different sounds. And there are a lot of cool sound choices, too, like 400 keyboard voices, 150 rhythms, 110 songs, and 10 digital effects. There is even a built-in microphone to record samples that you can add to your tunes. The software gives you 50 different lessons that take you through the basics, like hand position, note reading, time signatures, sharps and flats, and more. You’ll even get feedback so you know where you stand and what you need to keep working on. 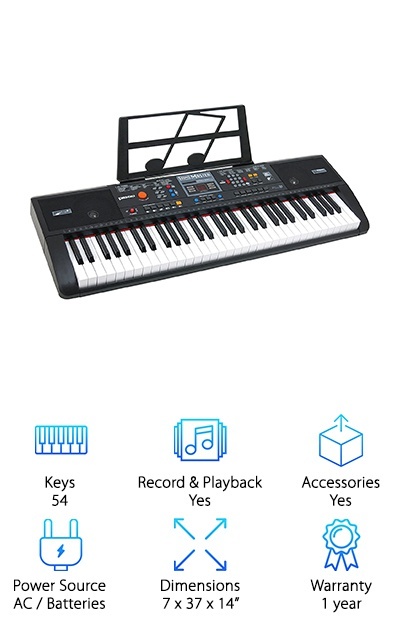 This Best Choice Electronic Keyboard helps beginners learn about finger placement and notes by using a special light up system in the keys. That’s not all the keys can do. There is a split key feature with light up one key, follow, and ensemble modes so you can play with different timbres on each side of the keyboard and make some pretty cool music, all by yourself. Even if you’re a beginner! In all, you get a wide range of different sound effects, like 255 timbres, 50 demo songs, and 8 percussion effects. This one includes an H-stand with non-skid feet and 3 different height adjustments. If you want to use your own educational material, the USB and AUX ports make it easy to hook this keyboard up to any device. 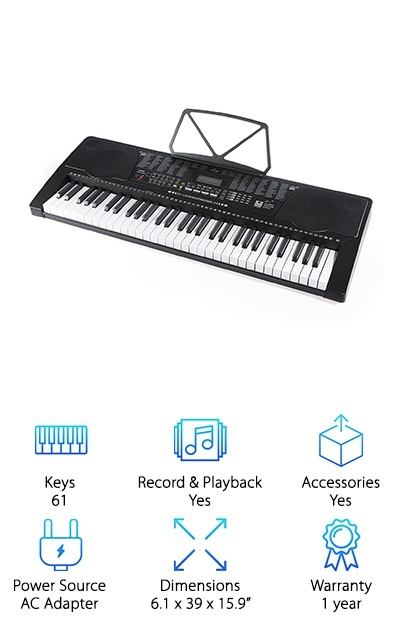 Considering how much you get with this one, we’re confident in saying this is a good cheap keyboard piano. What’s all included? 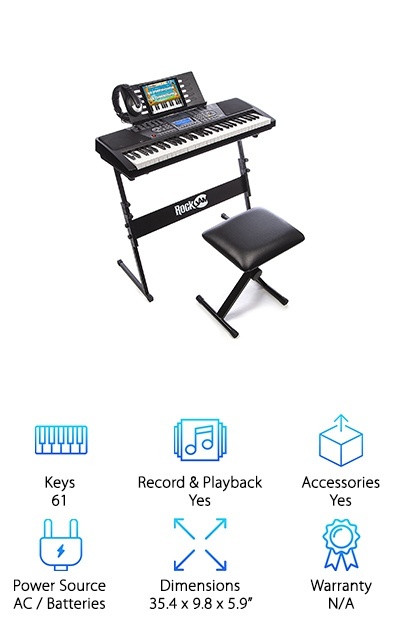 You get a keyboard stand, a padded adjustable stool, and headphones. You also get the keyboard, of course, which is packed with features. The LCD screen displays various teaching modes which is one reason why this one is such a good choice for beginners. You’ll also use the LCD screen to navigate all the options, including 100 different sounds, 100 rhythms, and 50 demo songs. If you have a portable microphone, plug it into the port so you can sing along to your melodies while you play. One more thing. You also get a free download of the Piano Maestro iPad app.